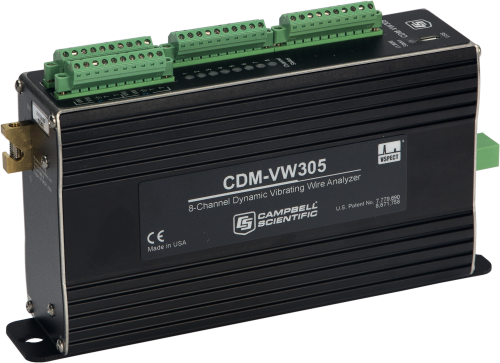 The CDM-VW305 is an 8-channel interface between sensors and dataloggers that allows shorter intervals between measurements. This interface uses an excitation mechanism that maintains the vibrating-wire sensor in a continuously vibrating state. The interface measures the resonant frequency of the wire between excitations using the patented vibrating-wire spectral-analysis technolgy (VSPECT™). VSPECT provides very fine measurement resolution and also limits the influence of external noise by discriminating between signal and noise based on frequency content. Because of this technology, the signal can be carried through longer cables, giving flexibility in sensor and datalogger siting. The CDM-VW305 interfaces with standard vibrating-wire sensors, giving much faster and better measurements without having to purchase new sensors. The analyzer allows high data rates, and multiple CDM-VW305 modules can be connected to one datalogger. The CDM-VW300 is similar to this item, but has 2 channels. U.S. Patent No. 8,671,758. In addition to the dynamic vibrating-wire measurement, the CDM-VW305 makes several auxiliary measurements. 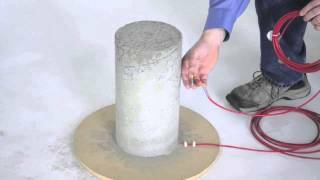 A static vibrating-wire measurement is made once each second, along with the dynamic measurements, which provides finer measurement resolution and greater immunity to external noise sources. The CDM-VW305 includes a thermistor input channel paired with each vibrating-wire channel, featuring high-precision 24 bit measurements at a 1 Hz rate. Lastly, a rich set of diagnostic parameters is provided with the vibrating-wire data. The CDM-VW305 has the capability to simplify post-processing of data by computing common values internally. Vibrating-wire data can be reported as measured frequency or as the frequency squared with a multiplier and offset applied. The thermistor data is reported as resistance or is converted to degrees Celsius using the thermistor’s Steinhart-Hart coefficients. The CDM-VW305 also can internally compile rainflow histograms from the final data and report the values at user-specified intervals. The SC-CPI Datalogger Serial-to-CPI Interface is required to connect the CDM-VW305 to compatible data logger (except the CR6). A 5-conductor cable connects the data logger to the SC-CPI, and an Ethernet cable connects the SC-CPI to the CDM-VW305. The data logger operating system must be version OS 26 or newer. The CDM-VW305 is not designed to work with multiplexers. Can more than one CDM-VW300-series device be used with one data logger? To communicate with CDM devices using the CPI protocol, the CR3000, CR1000, CR850, and CR800 dataloggers require an SC-CPI device. Only one SC-CPI device per data logger is required. It is expected that the design of future Campbell Scientific data logger products will work with CPI-based modules directly.